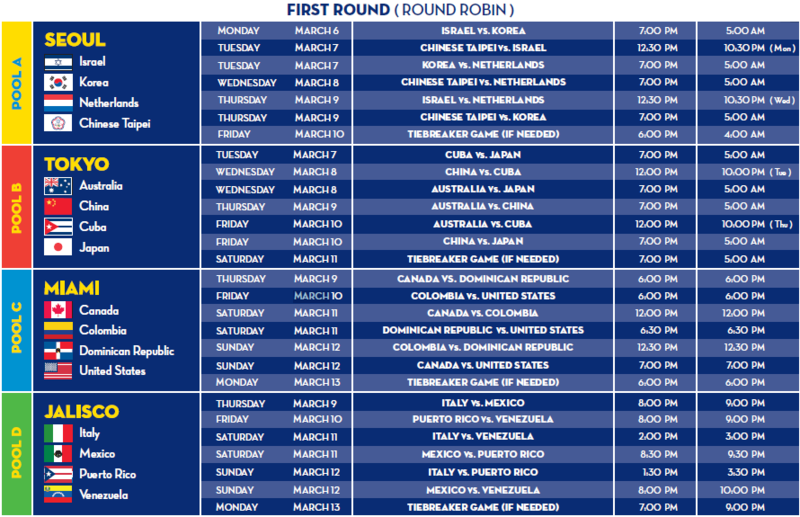 World Baseball Classic, Inc. today announced the full tournament schedule for the 2017 World Baseball Classic, which will begin on Monday, March 6th in Seoul, South Korea. The start date of the South Korea pool has been moved up by one day. As a result, that pool now becomes Pool A, with Tokyo, Japan becoming Pool B. Pool A, which will be played at the Gocheok Sky Dome in Seoul from Monday, March 6th–Friday, March 10th, will feature host Korea vs. first-time WBC participant Israel in the venue’s opening game on March 6th at 7:00 p.m. (all times local). Chinese Taipei and the Kingdom of the Netherlands will round out the rest of Pool A. Pool B, featuring Australia, China, Cuba and Japan at the Tokyo Dome, will begin play on Tuesday, March 7th, when two-time WBC Champion Japan takes on Cuba in the venue’s opening game at 7:00 p.m. Defending WBC Champion Dominican Republic will open Pool C against Canada at Marlins Park in Miami on Thursday, March 9th at 6:00 p.m. Colombia will make its WBC debut the following night at 6:00 p.m., when it takes the field against Team USA. Guadalajara, Jalisco, Mexico will host Pool D, which will also begin on Thursday, March 9th as host Mexico plays Italy at 8:00 p.m. The 2013 WBC runner-up, Puerto Rico, and Venezuela are the teams rounding out Pool D.
The First Round will again be a round-robin format, with the top two teams at each venue advancing to one of two Second Round pools. For the first time, a single-elimination tie-breaker game will be played if necessary to determine the second advancing team in both the First and Second Rounds. The Second Round, also a round-robin format, will be played at the Tokyo Dome and Petco Park in San Diego, California. Pool E at the Tokyo Dome, from Sunday, March 12th–Thursday, March 16th, will feature the winners and runners-up from Pools A and B, while Pool F at Petco Park, from Tuesday, March 14th–Sunday, March 19th, will host the winners and runners-up from Pools C and D. The winners and runners-up from each of the Second Round pools will advance to the Championship Round at Dodger Stadium in Los Angeles from Monday, March 20th–Wednesday, March 22nd. Ticket strips for WBC games played at Marlins Park in Miami and Petco Park in San Diego – which will include tickets for all games at that particular venue – will be available at www.worldbaseballclassic.com beginning on Thursday, November 17th. Tickets for WBC games played in Guadalajara, Jalisco, Mexico, Tokyo, Seoul, as well as the Championship Round in Los Angeles, will go on-sale at a later date. MLB Network is the exclusive English-language network and ESPN Deportes is the exclusive Spanish-language network of the World Baseball Classic. Each will air all games of the 2017 WBC in the United States.